Small but mighty, nuts are what we think of when we hear the phrase, "good things come in small packages." Nuts pack a one-two punch when it comes to flavor and providing heart-healthy omega-3 fatty acids, protein, vitamins and minerals. When enjoyed in moderation, nuts help you feel full and suppress your appetite, making them a terrific way to help you maintain a healthy weight. In addition to enjoying them raw as a snack, nuts can be used in baking and cooking or added to salads, cereals and yogurt for crunchy tastiness. As our name implies, we are the gold standard on the subject of nuts here at Oh! Nuts. 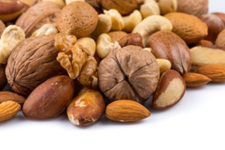 To ensure you received the freshest quality nuts at wholesale pricing, we have eliminated several middlemen - distributors, sub distributors and sub wholesalers. Our selection is farm and factory fresh because our inventory comes directly from wholesalers that deal directly with the brands. We have filled our inventory of nuts with the most popular varieties, including almonds, cashews, peanuts, pistachios, pecans, walnuts hazelnuts and peanuts. Sold in bulk, our customers are able to buy small or large quantities at an incredible value. Whether you will use them to snack on, bake or to create endless gift baskets for friends, family or fundraisers, we have the quality and quantity you need. Almonds have been pleasing the taste buds of people for thousands of years and are mentioned several times in the Bible. Believed to have originated in Asia and Africa, almonds were frequently eaten by explorers on their way along the "Silk Road" between Asia and the Mediterranean. Almonds eventually made their way to the Mediterranean, Spain, Portugal and France, and were first brought to North America from the Spanish missionaries in California. 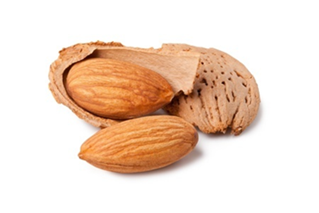 Despite commonly referred to as nuts, almonds are not true nuts, but rather seeds enclosed in a hard fruit covering. In fact, almonds are related to peaches, cherries and other stone fruits. When it comes to the health benefits of almonds, there are many. They are a terrific source of calcium, and are rich in fiber and vitamin E. Vitamin E is touted as an antioxidant that can help prevent such dangerous conditions as inflammation and certain cancers. In addition, a 1-ounce portion of almonds provides 9 grams of heart-healthy monounsaturated fats, 6 grams of protein, and 3.5 grams of fiber. When it comes to calories, almonds are one of the lowest-calorie nuts, with a 1-ounce serving having 160 calories. There are many uses for almonds; they may be eaten raw, blanched, or roasted and are commonly used in baking. Browse our selection of fresh, tasty almonds. They are available raw, dry roasted, in the shell, blanched, chocolate or yogurt covered, and seasoned with a variety of sweet and salty flavors. Native to Brazil, cashews have a distinct kidney shape and a buttery, slightly sweet taste. One of the things that make the cashew nut unique is that it grows inside the seed that hangs from the cashew apple of the cashew tree. As with many other nuts, cashews are bursting with vitamins, minerals and antioxidants, including vitamins E, K, and B6, along with minerals like copper, phosphorus, zinc, magnesium and iron. These minerals are important for helping maintain overall health, especially eye, heart and blood health. When it comes to fat, cashews contain a lot of good fats - mostly monounsaturated and polyunsaturated. When eaten in moderation and instead of saturated fats (bad fats) they can help improve heart health and prevent weight gain. According to the USDA, 1-ounce of cashews contains 157 calories, 0.9 grams of fiber and 5.17 grams of protein. Cashews are typically used in South and Southeast Asian cuisine and are also eaten on their own as a filing, protein-rich snack. They also make a sweet treat when coated with chocolate. Shop our fresh assortment for raw or roasted, salted or unsalted and flavored cashews sold by the pound. Did you know that peanuts are not "nuts?" That's right! Peanuts are actually legumes. 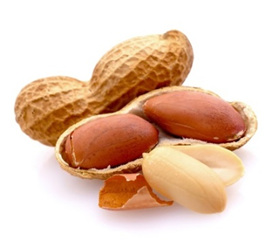 As opposed to walnuts, almonds and other nuts that grow on trees, peanuts grow underground. Peanuts belong to the single plant family, leguminosae along with beans and peas. The exact origin of peanuts is not known, but it's believed they originated in Peru or Brazil. Peanuts made their way into North America by way of Africans who introduced them beginning in the 1700s. Peanuts saw a rise in popularity in the late 1800s thanks in part to vendors traveling with the PT Barnum circus wagons who called out "hot roasted peanuts!" to the crowds. While peanuts are not nuts, studies show that they offer many of the same health benefits as their tree nut counterparts. Eating an ounce a day provides energy and a good source of nutrients, minerals, vitamins and antioxidants such as resveratrol which has been found to help prevent some cancers, heart disease and degenerative nerve diseases. When it comes to nutritional content, 1-ounce of raw peanuts has approximately 161 calories, 7.3 grams of protein and 2.4 grams of fiber. Our tasty selection of bulk peanuts can be eaten as a filling snack, as a protein-boosting ingredient in salads and other dishes, or as a yummy dessert when covered in chocolate. Choose from raw, roasted, honey glazed, yogurt covered and many other tasty peanut varieties. When it comes to tracing the history of pistachios, you have to travel way back thousands of years to the Middle East. The humble pistachio is even mentioned in the Old Testament. In Persia (modern day Iran) ownership of pistachio groves carried with it an elite status, and it was believed that Queen of Sheba loved pistachios so much she demanded that her land's entire supply be reserved for her and her court. Pistachios made their way to the United States during the 1880s. Our selection of bulk pistachios is available in many varieties, including raw and roasted, lightly salted, salted, no shell raw, no shell roasted and a number of seasoned varieties. We even have pistachio nut flour and chocolate-covered pistachios. 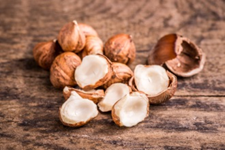 These versatile nuts can be eaten for a snack, sprinkled into a bowl of oatmeal, cereal or yogurt, and added to your muffin and baked goods recipes. High in fiber (2.8 grams), pistachios are filling and a great way to control your hunger when watching your weight. 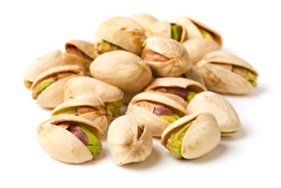 A 1-ounce serving of roasted pistachios contains 12.71 grams of mainly monounsaturated and polyunsaturated fats. These "good fats" can help lower your cholesterol levels and can cut your risk of type 2 diabetes and cardiovascular disease. Whether you pronounce it pi-ˈkän or ˈpē-ˌkan, one thing many can agree on is that pecans are nuts that are not only rich in taste, but rich in health benefits. Research from the USDA shows that pecans are the most antioxidant-rich tree nuts and rank among the top 15 foods with the highest levels of antioxidants. In addition, pecans are high in healthy fats known to aid in lowering "bad cholesterol," and contain more than 19 vitamins and minerals including vitamins A, B, and E, folic acid and calcium. Need another reason to love pecans? Just 1-ounce of pecans provides 10 percent of the daily recommended intake of fiber. Low in sugar and cholesterol, pecans have about 193 calories in a 1-ounce serving and 20 grams of fat made up of mostly monounsaturated fatty acids. These fats are known to help lower LDL or "bad cholesterol." Pecans are produced by the hickory tree and are native to Mexico and the south-central region of the United States. Derived from the Algonquian word paccan meaning nut with hard shell, pecans were a staple food for many Native American tribes. There are many ways to enjoy the sweet caramel flavor of pecans - eating them straight from the shell, mixing them with dried fruits, using them for baking and more. Our fresh assortment of quality pecans includes raw, roasted, honey glazed, chocolate drizzled, honey baked and more. Dating back to 7000BC, the walnut is one of the oldest foods produced by trees. This tasty nut is a popular choice for bakers as it requires neither roasting nor salting to bring out its natural flavor. Walnuts are a staple in every baker's pantry and are used in cookies, cakes, muffins and more. It also is a favorite for those who enjoy a crunchy, healthy snack straight from the shell. Walnuts are commonly grown in China, Iran, and within the United States in California and Arizona. California is in fact the leader in walnut production. When it comes to the nutritional value of walnuts, they pack a punch. Walnuts are high in monounsaturated and polyunsaturated fats and are a good source of protein. They have been linked to helping to decrease the risk of obesity, diabetes and heart disease. 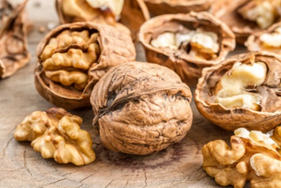 Bearing a resemblance to the human brain, walnuts contain a number of brain-healthy nutrients such as vitamin E, folate, melatonin, omega-3 fats and antioxidants. For those who are trying to maintain a healthy weight, the combination of healthy fats, protein and fiber in walnuts helps to keep you feeling full longer than eating simple carbohydrate foods. A 1-ounce portion of walnuts contains 185 calories, 1.9 grams of fiber and 4.32 grams of protein. Get your daily fix of tasty walnuts when you shop our inventory of walnuts. Sold in bulk by the pound, we sell them raw, in the shell, chopped, dry roasted and seasoned with salt and even draped in dark chocolate. Hazelnuts, also known as filberts, are marble-sized nuts that grow on the hazel tree. The majority of hazelnuts are grown in Turkey, Spain and Italy. In the United States, Oregon grows 98 percent of the nation's supply of hazelnuts. Like so many other nuts, hazelnuts have their fair share of good-for-you properties. Some of the benefits of snacking on hazelnuts include a great source of folate, vitamin E, vitamin B6, manganese, oleic acid and more. All of this adds up to helping support bone and joint health, preventing certain cancers, improving heart health and the digestive tract and so much more. A 1-ounce serving of hazelnuts has 180 calories, 4 grams of protein and 3 grams of fiber. Hazelnuts are the darlings of the baking world. They are delicious draped in chocolate and are often the nut of choice for many baking confections and liqueurs. They can also be enjoyed raw, roasted, or as an ingredient in many healthy dishes. Whichever way you prefer to enjoy hazelnuts, we always have the freshest nuts available. Sold in bulk by the pound, you can shop for hazelnuts that are dry roasted, blanched, raw, in the shell and chocolate covered. We even have ground hazelnut flour for your baking needs. Although packed with many of the same nutrients and health benefits of tree nuts, pine nuts are not actually nuts. They're the seeds of pine trees. These seeds are found between the scales of pine cones, but only about 20 species have pine nuts large enough to eat. These trees are found in Asia, Europe and North America. The history of pine nuts goes way back to the Paleolithic period. Greek authors mention pine nuts in their writing as early as 300BC. Pine nuts are often considered a delicacy in many countries and they're commonly eaten raw or roasted, and added in vegetable dishes, stuffings, sauces, soups, stews, and to make pesto. Pine nuts are especially tasty when toasted and enjoyed by the handful or sprinkled on your favorite salads. In addition to having a savory buttery taste, pine nuts are your allies when it comes to staying healthy. They're filled with vitamins, nutrients and antioxidants such as monounsaturated fat, protein, iron and magnesium that help suppress your appetite, boost energy, reduce heart disease risk, protect vision health and more. A 1-ounce serving serves up 191 calories, 3.8 grams of protein and 169mg of potassium. Shop Oh! Nuts for the freshest quality pine nuts conveniently sold by the pound.